Salad is an easy, fast, and healthy side dish that adds a fresh splash to any meal, but when you want to make a salad your main dish there are a few things you should watch for to make sure you won’t be robbing yourself of nutrients and leaving yourself on empty. With a little planning it is possible to have a very healthy, filling, and delicious salad that includes all of the recommended MyPyramid food groups. Adding meat can give you a protein punch that will help your salad stick with you longer. Nobody likes to eat and then be hungry an hour later! Cooked dry beans can count in either the Meat & Bean or the Vegetable group and add the fiber we all need. Don’t forget the flair that fresh fruit can give in a salad. We all lean toward lettuce, tomatoes, and cucumbers, but adding apples, craisins, grapes, and other fruit can add amazing flavor to a dinner salad. 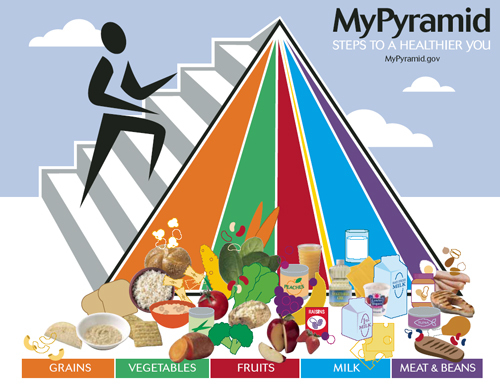 Use the food pyramid below and try to find or create salad recipes using as many as the groups as you can. The different flavors and textures will make it tasty and interesting and give you lots of room to play with new flavors in your salad. The following recipes will help give you some ideas of new things to try. Combine first 6 ingredients in a shallow dish. Stir well; set aside. Combine chicken and buttermilk in a bowl; stir. Cover; marinate in refrigerator 30 minutes. Drain; dredge a few strips at a time in breadcrumb mixture, tossing to coat. Coat a nonstick skillet with cooking spray. Add oil; place over medium heat until hot. Add chicken to skillet; cook 3 minutes on each side or until done. Arrange 1 cup lettuce on each of 4 plates; divide chicken and beets among plates. Top with 2 tablespoons dressing and 2 tablespoons cheese. Serves 4. Add seeded, chopped jalapeño to taste. 1. Heat a grill or grill pan over medium-high heat. Brush the steak with 1 tablespoon of the olive oil and season with salt and pepper. Grill for 5 minutes on each side for medium-rare; set aside. 2. In a medium bowl, whisk together the Worcestershire sauce, 1/2 teaspoon of salt, the garlic, the mustard and the remaining 3 tablespoons of olive oil. Add the steak and marinate for 15 minutes. 3. In a large bowl, combine the cucumber, bell pepper and corn. 4. When the steak is done marinating, place it on a cutting board and pour the marinade into a small saucepan set over high heat to simmer, about 1 minute. Slice the steak into 1/4-inch-thick strips and add to the vegetables. Add the marinade, mint and salt and pepper to taste, and toss. 5. Divide the greens among 4 dinner plates. Drizzle with olive oil and salt, then top with the steak strips and vegetables. Serves 4. Using a vegetable peeler, peel carrot into strips and set aside. Bring a small saucepan of heavily salted water to a boil. Add green beans and cook for 2 to 3 minutes. Drain and transfer to a bowl of ice water. When beans are chilled, drain again and pat dry. 1. Whisk vinegar, oil, dill (or oregano), garlic powder, salt, and pepper in a large bowl. Add lettuce, chicken, tomato, cucumber, onion, olives, and feta; toss to coat. Serves 2.